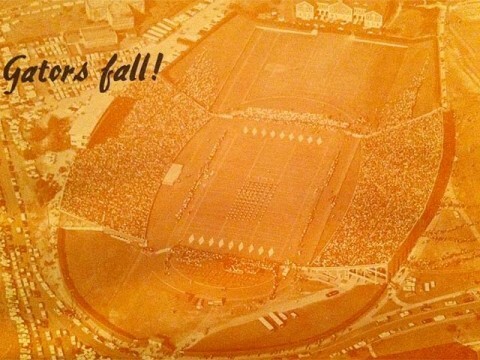 Aerial view of Cliff Hare Stadium and fallen Gators taken in 1957. I originally wrote this article as a “primary sources research paper” for Anthony Carey’s History Research Methods course in 1996, while working on a History PhD at Auburn. (I believe Dr. Carey was at least as amused by my love for the subject matter as he was impressed with my academic skills on display, such as they are.) Years later, I posted it to my Web site for all to see, and over the years it has been linked to by Wikipedia and (supposedly) copied and used by the Auburn University tour guides. I have occasionally added to it, as new developments occurred. Now I present it here. My first visit to Jordan-Hare came as a kid during the late 1970s, and I’ve enjoyed a love affair with the grand old edifice from the very start. I hope that love shows through in the article to follow. I’m not able to get back to the Loveliest Village nearly as often as I’d like to, these days (my last visit was for the Iron Bowl in 2007), but I was in attendance for some important milestones in recent history, including the opening of the East Deck in 1987 (against Texas), the “First Time Ever” game in 1989 and the dedication of “Pat Dye Field” in 2005. I can’t wait to visit again—though it’s hardly “visiting” when you consider a place your true home. Here’s the story of that home. If football is truly a religion in the American South, then Jordan-Hare Stadium is a grand cathedral. To this special place, the faithful roll in for games like pilgrims headed to Mecca. More than a simple sports arena, the structure holds a special place in the hearts of Auburn people, as the scene of some of the happiest memories of their lives. It indeed borders on a level of spirituality, the attachment of these people to this stadium. Though the feelings elicited by the structure are clear, the reasons for its existence are somewhat more complex. How has a world-class sports arena, capable of holding so vast a population—larger than most NFL stadiums—sprouted up over the past sixty years on the plains of east Alabama? Fragments of the answer can be found in a number of places, including Atlanta, Montgomery, Columbus and Birmingham. Ultimately, however, the answer lies in the vision of a handful of men who, over the years, believed in the potential of Auburn’s football program, and who worked to bring the dream to fruition. In two years—2014—Jordan-Hare Stadium will turn seventy-five years old. That fact alone makes it more than worthwhile to take a brief look back at the fascinating history of the construction and growth of this grand edifice. Before the Tigers came to claim Jordan-Hare as their home, the teams played on two other on-campus fields. Both now lie under concrete, asphalt, and floral arrangements. In the shadows of the chemistry lab building between Samford Hall and Foy Union, which was at last check a park and a parking lot, Auburn hosted football games on what was called the “Drill Field” from 1892 until the 1920s. Abandoning this location, the Tigers moved to Drake Field—an area later to be paved over as part of the Haley Center parking lot, next to the original site of the Eagle’s Cage and also near the women’s dorms. By the late 1930s, crowds were too large to be adequately accommodated in the temporary bleachers at this location, and Auburn found itself forced to play most of its games on the road, usually in Birmingham’s Legion Field, Montgomery’s Cramton Bowl, Mobile’s Ladd Stadium, and Memorial Stadium in Columbus, Georgia. From this unhappy situation, with the team forced to play its “home games” far from home, came the seeds of the mighty edifice which now graces the Auburn campus. As early as 1934, the university’s Physical Plant had considered building a “concrete stadium to put Auburn on the map,” though with the lingering effects of the Depression, nothing had come of it. The money simply wasn’t there. By 1937, the decision had been made to build, should the funds become available. Finally, they were. Moving to a third site, preparations were begun for the construction of a permanent facility: “Auburn Stadium.” A young Jeff Beard, helping to survey the area, drove in the first stake to mark off the future stadium. Auburn has played on this site ever since. By 1938, the economic situation had improved to the point that Auburn President Dr. L.N. Duncan could report the approval by PWA Secretary Ickes of “the most ambitious building program ever undertaken by the Alabama Polytechnic Institute.” While much of this new construction would include non-athletic facilities, among items included in the $1,446,900 PWA-funded project was the construction of a $60,000 stadium unit, which included erection of concrete stands, engineering work to prepare the area, and completion of a modern track facility. The original concrete grandstand, dubbed “Auburn Stadium,” was designed by Arnold G. Wurz, who passed away in 1989, just weeks before the stadium’s fiftieth anniversary celebrations. The name choice, “Auburn Stadium,” is significant in that it reflects the tendency of all associated to refer to the team and school as “Auburn,” even as far back as the 1930s. The school was actually designated Alabama Polytechnic Institute and did not officially become Auburn University until 1960. By November of 1939, Coach Jack Meagher, who had coached the team on tiny Drake Field, at last had a stadium of his own, modest as it was. Having played Florida in a number of different cities over the previous years, the Gators seemed a good opponent with which to christen the new, 7,290-seat facility. “People wondered what we were going to do with that many people coming to town,” Beard said. How would little Auburn, Alabama ever be able to accommodate a couple thousand Gators? Restrooms in particular were a concern, as the town itself had only two gas stations with public facilities at the time. The field house—later transformed into the Geology building, Petrie Hall—was also under construction and not completed in time for the game. (If you’ve ever noticed the oddly symmetrical and perfectly perpendicular orientation of Petrie Hall to the north end zone of the stadium—something that puzzled me greatly while I was a student—now you know why.) Florida players were forced to dress in uniform in their hotel in Opelika before riding to the stadium. Incidents such as this over the years further complicated Auburn’s efforts to move important games to the campus. Auburn and Florida tied, 7-7. The staging of the game itself was a success. Those original 7,290 seats remain today as the lower half of the west stands. Only a year later 4,800 wooden bleachers were added to the east side, demonstrating the viability of a home field and dispelling the doubts of the naysayers. Auburn Stadium was open for business, and it seemed there was nowhere to go but up. And around! 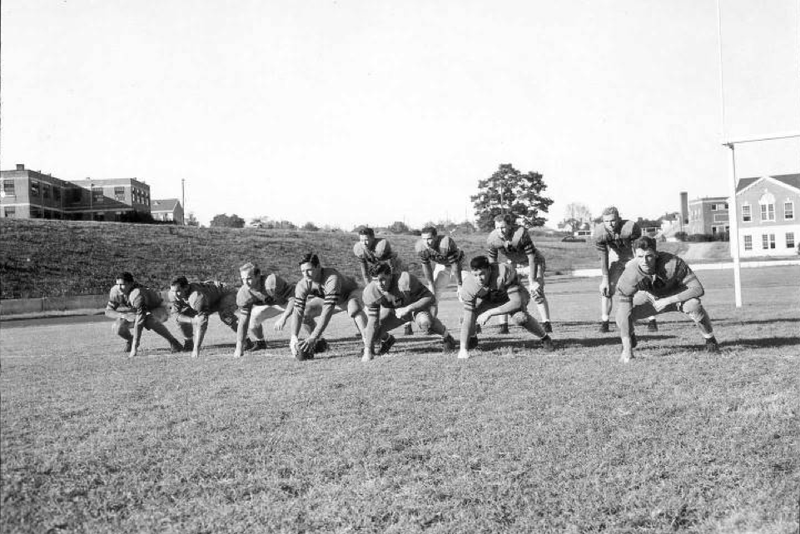 Auburn’s football team practicing in Auburn Stadium—at least that’s what the caption says—in 1946. Despite the stadium’s success, only twelve home games were played there during the first decade of its existence, between 1939 and 1949, as Auburn continued to struggle to convince other teams to travel to East Alabama to play football. To make matters worse, in the final three years of the decade, the team won only three games. For some programs, that would have marked the kiss of death—the program would have stagnated with poor play and a small facility mutually feeding upon one another and resulting in a second- or third-rate program overall. Fortunately, the Auburn Family was as devoted a bunch of fans then as they are now, and one that demanded the college field a quality team with a quality facility in which that team could play. Even in the lean times of the Forties, the seats had been filled. With such an obvious financial incentive, by the end of 1948, the time had come for expansion. Dr. Clifford Leroy Hare served as State Chemist and dean of the School of Chemistry and Pharmacy at A.P.I., as well as faculty chairman of athletics. He also played backup quarterback on Auburn’s very first football team, in 1892. The caption in the 1934 Auburn-Georgia game program calls Cliff Hare “one of the most beloved characters connected with athletics in the South.” He seemed the perfect choice for whom to name the stadium. David Housel, writing in the 1973 Auburn Football Illustrated, tells of Shug Jordan’s long afternoon talks with the aging Cliff Hare. “Fesser Hare told me how he and Dr. Sanford—for whom the stadium in Athens is named—used to come to Auburn every year after the Auburn-Georgia game in Columbus and divide the money. They would sit down in the Hare kitchen, take the money out of an old cigar box, and spread it across a marble table top and say, ‘a dollar for you and a dollar for us’ until the game proceeds were divided equally between the two schools.” (One can only wonder how those two venerable professors would have reacted to today’s world of gargantuan stadiums and zillion-dollar television contracts.) From these experiences, Hare saw the advantage of a larger stadium in Auburn at least as clearly as anyone else. He wanted it to happen. The Tigers simply needed to find the right coach to start winning ballgames. With the arrival of Coach Ralph “Shug” Jordan in 1951, the stadium’s growth was assured. Quickly reversing the Tigers’ football fortunes, Jordan took the team to two straight bowl appearances. Success on the field quickly led to financial success. With the capacity of the stadium having reached 34,500, Auburn could host four home games in 1955: Chattanooga, Florida, Furman, and Mississippi State. (The Tigers won all four games, shutting out Florida and Furman, and would end the year with a regular season record of 8-1-1.) Playing and winning those four games at home, Beard said, “was a great feeling for those of us who were tired of traveling. Four games showed us what a great advantage it was to play at home.” The commitment had at last been made to bring Auburn’s opponents to the campus. Even so, still none of the Tigers’ major rivals (aside from Florida) would play in Auburn. No Alabama, No Georgia, no Tennessee, no Georgia Tech. Beard and Jordan next would turn their attention to this problem, with their focus falling first on Athens and on Bulldogs Coach Wally Butts. These days Auburn boasts one of the largest HD screens around, measuring 30 feet high by 74 feet wide. In 1957 they had this. The year 1957 saw Auburn climb to the very pinnacle of football success, going undefeated and winning the AP National Championship. Coach Jordan had demonstrated that the Tigers were a force to be reckoned with, and this gridiron success provided leverage in Auburn’s negotiations with other schools. Georgia won the first game played back in Athens in 1959, ironically with a young Georgia guard named Pat Dye recovering a fumble to win the game for the Bulldogs. The next year’s game would be played in Auburn, and Jordan and Beard realized they would need still more seats in the stadium. The time had come to close in one of the end zones, connecting the two stands at one end. A memorandum from L. E. Funchess, Director of the Campus Planning Committee, to Beard, dated March 3, 1960, reports approval of the plan to close in the south end zone, at a cost of nearly a half-million dollars. The bleacher seats which had stood there were moved to the north end, providing still more seats. (The north end would otherwise remain open, allowing access to the field house that would become Petrie Hall.) A large scoreboard replaced the previous one which had been built by an engineering class years earlier. In addition, dressing rooms were built under the new stands. An overall plan for the stadium’s development began to take shape with the 1960 expansion. The sidelines stands had been built into hillsides, so the closing of the end zones would have blocked air circulation within the stadium. To remedy this, risers were left out of the lower seats in the south end zone. This, along with construction of a continuous interior concourse, was modeled on the Rice Stadium in Texas. (It’s hard to imagine today that Auburn modeled its premiere athletic facility after something the Rice Owls had built first.) The single-level, continuous concourse allowed direct access for first aid vehicles and transports to any point within the stadium, and also made it easier for attendees to move about the stadium and to and from their seats. The project was a success. The Georgia game sold out quickly (with Auburn winning this time, 9-6), and both Georgia and Auburn officials were pleased with the results of their new arrangement. The city of Columbus, however, felt betrayed by the move—an attitude that would be repeated by some of the leaders of the city of Birmingham nearly thirty years later. Winning seasons and bowl invitations continued through the 1960s, and thoughts quickly turned to another expansion. Beard summed up the feelings of Auburn’s leaders at the time: “Adding…seats had enabled us to have a representative home schedule and collect the stadium rental that would be so vital to the future of the program.” With this in mind, and in view of the continued sellouts in the horseshoe-shaped Cliff Hare Stadium of the 1960s, plans moved forward for the complete enclosure of the stadium by 1970. The Board of Trustees, on October 25, 1968, unanimously approved a proposal to begin study for again enlarging Cliff Hare Stadium, “due to the continued increase in student enrollments and the demand for football tickets at home games in Auburn.” The Board went to great lengths to specify that this was contingent on acquisition of funding, which must not come from the school’s general funds. The Board agreed by June of 1969 that “it appears necessary and advisable to enlarge the capacity of Cliff Hare Stadium, enlarge the present press box facilities, and construct a new running track facility.” The resolution also called for modification and enlargement of the dressing facilities. The June 1969 resolution noted that an act had been passed in the first special session of the 1969 state legislature “to permit such construction and to make provisions for the financing of same.” With the money no longer a major concern, plans moved ahead quickly. In the mean time, the Board’s Naming of Buildings Committee recommended that the former field house, which would be sealed off from the stadium by the north stands enclosure and which was being renovated for classroom and lab use, be named for the late Dean George Petrie, who had connections with both the sciences and athletics at Auburn. The Monsanto Company, on March 24, 1969, proposed in a memo to Coach Beard the installation of AstroTurf in Jordan-Hare. Their letter lists the cost of covering Auburn’s playing field in artificial turf at $212,500.00. Turf had become popular among colleges in the late 1960s—nearly everyone was doing it, including the University of Alabama. Despite consideration, however, Beard and Jordan rejected the idea. They had misgivings about the safety of the artificial surface. “It turned out that we were right,” Beard says. Auburn never went to fake turf, and eventually most schools switched back to natural grass—at least until the most modern and safe artificial surfaces came along in the 1990s and 2000s. Expansion plans were finalized at a Board meeting on November 22, 1969. The Trustees were clearly enthusiastic about Auburn football: “Dr. Philpott (the university president) reviewed several details concerning Auburn’s invitation to play the University of Houston in the Astro-Bluebonnet Bowl on December 31, 1969.” When Philpott noted the presence of Coach Jordan and Coach Beard, the Trustees broke out in wild applause. The Board unanimously approved a nineteen year bond issue to finance the north stands construction, and then gathered around Dr. Philpott to look at an artist’s conception of the finished stadium. The final cost of the addition, including the relocation of Hutsell Track to its new location, was just over one and a quarter million dollars. Tiny Cliff Hare Stadium, formerly only a single set of concrete bleachers, had grown into a full-fledged bowl, and the time had come to honor the coach whose success enabled the growth to occur. “Today’s game will be Auburn’s first SEC game in newly-named Jordan-Hare Stadium, which was dedicated in pre-game ceremonies.” So wrote Buddy Davidson in the official program for the Ole Miss game of 1973. The honor recognized “Jordan’s lasting contributions to Auburn football.” Auburn’s stadium had become the first in the nation to be named for an active coach. Jordan would coach the remainder of that season and two more before retiring after the 1975 season. Writing in the program for the dedication game in 1973, David Housel, Sports Information Director and later Athletics Director, reflected back on the competitive advantage Auburn had gained with its fine home stadium. He called the newly-christened Jordan-Hare Stadium “perhaps the hardest place in the country for a visiting football team to win. Bar none.” He supported this bold statement with a little history: While the facility was known as Auburn Stadium, from 1939 to 1949, Auburn did not lose a single game of its twelve played there (with two ties.) During the Cliff Hare Stadium period, from 1949 to 1973, Auburn posted a record of 80-13-1, which included a run of thirty straight wins at home (with thirteen shutouts). Housel pointed out that many of those wins came against such powers as Georgia, Florida, and Georgia Tech. Auburn would enjoy a similar run during the 1980s under Coach Pat Dye, and again from the mid-1990s-on under Coaches Terry Bowden, Tommy Tuberville and Gene Chizik. Housel also wrote of the monetary advantage for visitors playing in Jordan-Hare. Now the shoe was on the other foot—teams wanted to play in Auburn because they could make more money doing so than they could by playing the Tigers at home. He described Jordan-Hare as “an extremely popular place to play football” in the South, despite Auburn’s considerable home field advantage. “The reason,” he explains, “is money, the greenstuff without which an athletic program cannot function.” With a tremendous season ticket base and consistently large crowds, even the smallest visiting school enjoys a healthy payday, “one of the largest in the United States,” according to Housel. Photos via the 1947 and 1957 Glomerata. Part Two of his History of Jordan-Hare Stadium will be posted next week. Related: The secret history of Pat Dye Field. Awesome piece! I had Dr. Carey a few years before your class – just after he arrived at AU – really good professor and always enjoyed his classes. That was great! Looking forward to part 2. Great piece. 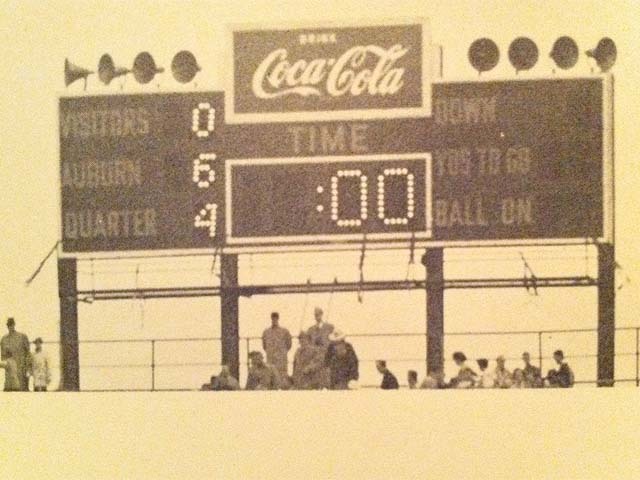 My first AU game was Auburn’s “home game” in about 1955 or so….against Clemson in Mobile’s Ladd Stadium where as a boy scout, I helped people find their seats and got in free. The building between Samford Hall and Foy is Ross Hall. It is no longer chemistry labs. Today, it is the Chemical Engineering building.